Guess I might as well give my thoughts on the Getters. A Taiki unit with the potential to be a tanker if conditions are right. I just don't like the fact you can't assign Ryoma's Pilot Part on this one, which means accuracy can be an issue if fighting highly agile units. Other than that, it's not to be underestimated just because it's a basic unit you can actually get off the Base Gacha as the 40% boost to ATK means it can bring in a lot of hurt. Not a Taiki unit, but it has served me well in the Arena Mode since the whole thing started. Guess that's why this unit's been nerfed a lot. The Shine Spark used to ignore virtually every special defense, and now can only ignore Guard. This is also the only unit Ryoma's Pilot Part can be assigned to, which includes the ever crucial Sure Hit seishin when dealing with high AGI units. Just don't expect to hit units that have Bunshin like the Billvine and F-91. I could be wrong, but any unit assigned as a Guardian will have its Hissatsu always hit and deal full damage, irregardless of any special defenses against it. So if Dragon is assigned as a Guardian, the Shine Spark will hit and may even ignore Bunshin. Again, I'm not 100% on this. 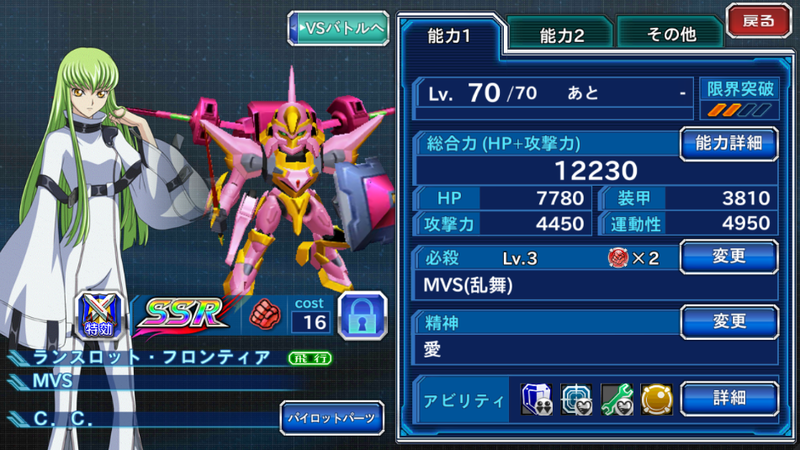 And Here we have the first Code Geass R2 unit that we can have access too, its our 3rd Lancelot this time a support unit, with not much to offer on attack but a lot to bring from the support perspective, some interesting skills and a effective kit on my opinion. so lets go to it. the MSV Dance, cause medium damage to a enemy on C.C, we are talking about or old 600% modifier remember? for C.C its a little difference, she hits for 750% on total on all her 3 attacks, while this looks pretty good to nuke something its not very efficient since the unit lacks attack power, but its also not too bad since its not Fa levels of bad like small damage to a single enemy. 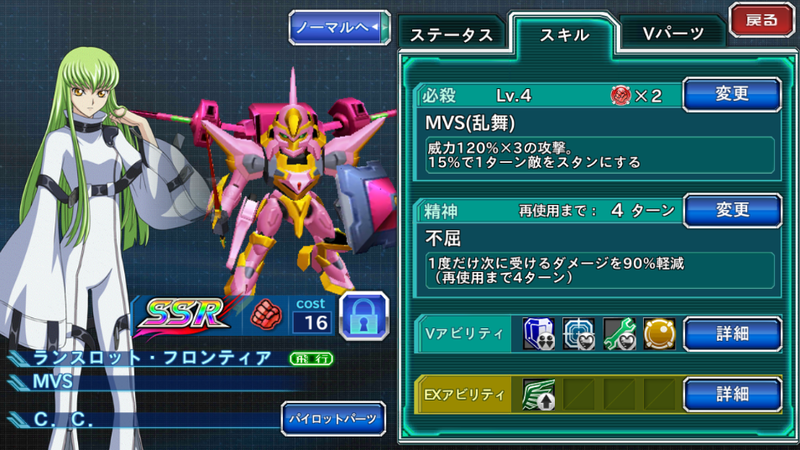 Also the MSV Dance only use 2 cores, and that's nice. This is the damage of the first slash, the first and the second slash cause litte damage the last one have a much higher multiplier, she normally hits on neutral enemies for 4.5k/7k/10k. doing a total of 21k of damage on a neutral target with no soul and that's not half bad at all, but before thinking its such a big damage remember that despite being a nice number it hits a single enemy, and its impossible to hit this on more than one enemy. This Lancelot also don't suffers from the Code Geass units syndrome of having only 2 slots, her rates on terrains is A/A/A/B meaning that if its a space stage she will still struggle to move fast, that's the same Terrain Rates of Guren Seiten, and Lancelot Albion, the difference its that both Suzaku and Kallen have passives that allow them to move faster normally so on space they will just move on normal speed and C.C. will move like a slug so you might consider deploying Zechs. her Seishins are still the same. you should riase all the seishins you might need them all if you plan to use Lancelot Frontier on the Arena since its a pretty good unti to use there. Calm - When the Hp its bellow 2/3, Amor Up, Hit rate Up and Evasion up. Essence of the Pizza Woman (that's a strange name i give them that) - This skill its awesome, it gives 2 attacker core at the start of the battle, meaning that C.C its pretty meanie to fight against on the Arena allowing units like Tekai Lancelot Grail to instant BLOW enemies on turn 1.
not only that she also save lives on the Conquest mode where cores are very hard to come by, better yet deploying C.C. save you the trouble of deploying weak units to suicide to gives you a core. this will buff all your team attack and defense give them cores, give you a heal, and a lot of attack power. MVS Ranbu - Costs 2 Cores; Attacks one enemy; 120% damage x3; 15% of Stun for 1 Turn. 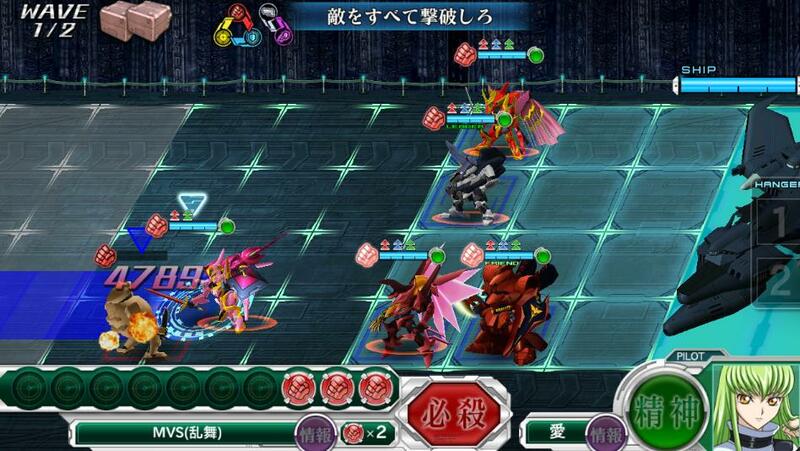 Loved by the Geass - Allies get 40% boost in Armor and increased Action Gauge Speed. Calm - When HP is less than 2/3, increase Accuracy & Evasion by 20%. Pizza Delivery - Heals 15% HP to all allies per turn (compare it to Marvel's ability, which is nerfed to 2%). Expect this to be nerfed in the future. Essence of the Pizza Woman - Bonus ONE core (not two) at the start of battle. At the moment, C.C. is the best Attacker-class Healer, with her only drawback being her stats as average at best with no special defenses. I would think of putting in V-Parts that focuses on HP and Armor to keep her alive and make use of her Seishin and Ability to keep my team alive in the Arena. For now best to make use of her until she is eventually nerfed. *That's what I got off Google Translate and I get the impression it is what it is - Catalina's a hoe. Decided to not do the same mistake again with the Lancelot Frontier and will go ahead and spend 90 Crystals on her just to activate her EX ability. (I realize I haven't played a single Challenge Mission, so I can get those back by playing those) She's quite a replacement for Tieria and Ple II as she greatly increases Accuracy to your team - something you need to have against the likes of Eureka, Chirico, and Suzaku in the Albion. Her Hissatsu will also help take care of Bunshin units, plus it costs only 1 Core for a decent amount of damage and reduces the enemy's Evasion rate. Set her up with any Shooter-class Super Robots like Combattler, J-Der, Grendizer, and Gunbuster, and you got quite an All-Shooter team that are also tankers, AND can hit accurately. Catalina's downsides are her stats and doesn't have any special defenses. I personally would install Life and Armor V-Parts to compensate, but if I want to go high risk, I'd give her a full Scope set so she gets to hit more often. On Normal and Conquest Mode, you'd want her in stages where you fight a full Attacker team thanks to her final ability. Since her abilities and seishins in Normal/Conquest are built mainly for power, I'd go for the Enhancement Parts that greatly raises ATK for maximum efficiency. I updated the first post with everything. Great work guys! Wondering if I should just give her my latest SSR Crystal to get her to 70. I managed to get the 30 crystals to get a second one this morning. I might be able to pull a third via remaining crystals in Challenge missions, But I have no idea what they're even asking for. GGG has one of most insane DEF buffs ever and you need units that ignore those buffs AND a high ATK to do some real damage. Otherwise, you'll be spammed by the Guardian before you could even finish Guy off. 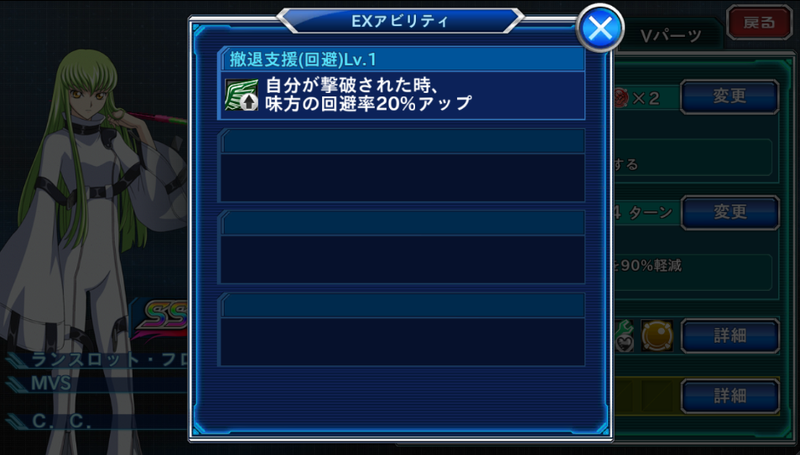 R2 Suzaku has an insane Dodge Rate and can be impossible to hit when all of its abilities are triggered. Can't say much on Defenders since I get to kill them quite easily with the Getter Dragon. Blame on the fact they lack any mobility. Nono and Combattler have the highest ATK rate of all the Taiki units, and Shooter Amuro can cause Darkness after using the Fin Funnels. Current time: 04-24-2019, 01:58 PM Powered By MyBB, © 2002-2019 MyBB Group.